Kid with a Bowler Hat, a photo by The Derek on Flickr. I absolutely love this image by Derek McClure. 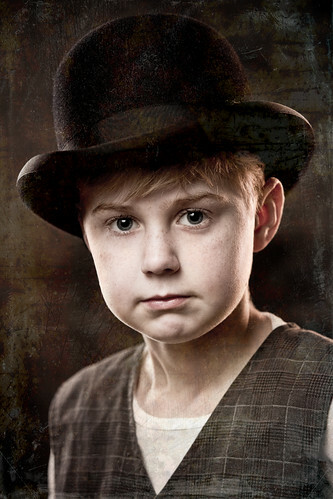 The photo itself is great, with the young boy looking so openly into the lens of the camera, perfectly lit, with a really nice catchlight in the eyes, and whimsically costumed in the old bowler hat, vest, and white shirt. But that's only the beginning of the image. Derek has add to the image by desaturating it, gving it just a touch of the sepia tone but not too much, and adding just a bit of the old scratched and textured background as if it were made on an imperfect glass plate. The textures are masked around the face, so as not to detract from that wonderful expression and beautiful eyes. I like that handling. Not usually a fan of texture or sepia, but this is nice!